This is a really basic silver glitter topper. 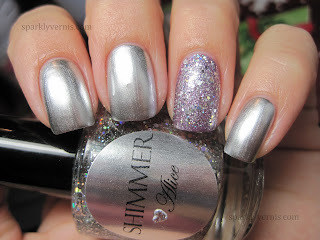 I say topper because unlike other Shimmers, this requires four coats for opacity. I definitely think it looks better for layering, especially for glitter sandwiches. Alice is the silver version of Tracy. It's so great for accent nails too, I received a lot of compliments on the first mani shown. I love the way you do several different looks for the same polish. Great !